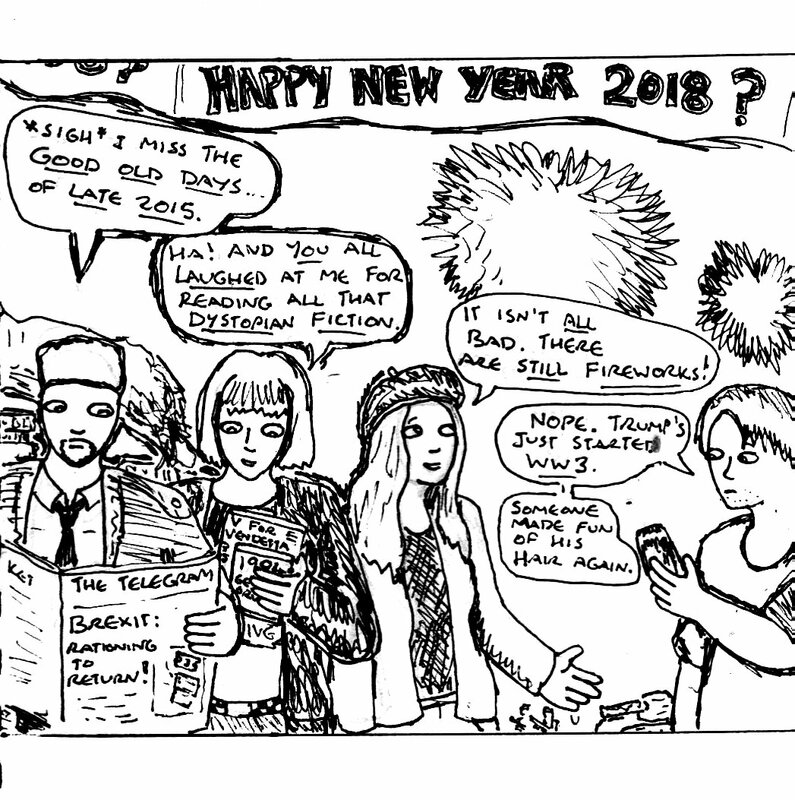 Happy New Year everyone 🙂 As regular readers know, I make these comics ridiculously far in advance and this one was made in early March. After all of the political upheavals of 2016, I found the idea of being optimistic about new years had lost some of it’s charm. So, this cartoon ended up being a bit on the cynical side. Many more comics featuring these characters can be found in the ‘2016’ and ‘2017’ segments of this page. Likewise, here’s the ‘Work In Progress’ line art for today’s comic. Well, it’s the end of the month (and the year). So, I thought that I’d do my usual thing of compiling a list of links to the ten best articles about making art, making comics and/or writing fiction that I’ve posted here over the past month. As usual, I’ll include a couple of honourable mentions too. All in all, this month has been something of a variable one in terms of the quality of my articles. It was probably a better month than the previous one, although it’s still probably not quite the best one that I ever had. Well, unfortunately, I was feeling slightly uninspired. So, this digitally-edited painting ended up being a random cyberpunk cityscape (since I can pretty much paint these in my sleep). Well, I hadn’t planned to write about the horror genre but, the night before I wrote this article, I had a disturbing nightmare that made me think about this genre. Although I won’t describe the nightmare in too much detail (since, amongst other things, I hope to have forgotten the exact details of it by the time this article goes out), it was a dream where nothing disgusting, disturbing or repulsive was directly shown to me. Yet, I still woke up in a very freaked out mood. This, naturally, made me think about the role of implication in the horror genre. It’s a well-known fact that the audience’s imaginations will always conjure up worse horrors than anything that a writer or film-maker can directly show. But, I thought that I’d look at why this happens and why it sometimes doesn’t. Simply put, implying a horrific event in a horror movie, novel or comic reduces it to the level of an idea. If that idea, in and of itself, is especially disturbing, grotesque, unusual and/or horrific, then the implication of it will be too. This is why, for example, a horror movie like “The Human Centipede” can generate controversy, shock and notoriety despite containing very little gory detail. Yet, something like a zombie movie barely raises an eyebrow because.. well.. everyone knows what the “idea” behind a zombie movie is. By reducing something to an idea, it becomes especially disturbing for the simple reason that ideas demand to be interpreted in unique ways. There’s a reason why, for example, copyright law doesn’t protect ideas. If ideas could be copyrighted, most creative works wouldn’t exist. Two people’s imaginations can do radically different things with the same basic idea. So, by giving the audience an idea, an author or director forces the audience to interpret it in their own way. It forces the audience to actually think about the subject in question. This also means that the horror lingers for much longer because it’s easier to start thinking about something than it is to stop thinking about something. Likewise, the most disturbing scenes in horror movies and/or novels are the ones where you find yourself thinking “Oh my god! Someone actually had to think of that!”. If an idea is horrific or disturbing enough to elicit this kind of reaction, then the audience is going to react in this way regardless of the level of visual or descriptive detail. The “Saw” films are a great cinematic example of this type of horror, where the characters are frequently placed in impossible “catch-22” situations which always result in death or injury for someone. But, as the final episode of season four of the BBC’s “Sherlock” showed, this type of horror doesn’t have to be gruesome to disturb audiences. The basic idea behind both things is the most disturbing part. For every diabolical contraption or impossible dilemma shown in either these films or that episode of “Sherlock”, someone actually had to come up with that idea. So, yes, implication is especially disturbing in the horror genre because it relies on ideas. If the idea is disturbing, then it will be disturbing regardless of the level of visual or descriptive detail. Well, this digitally-edited painting was another strange one. Originally, I’d planned to remake a painting of mine from 2014 but, whilst sketching it, I realised that the remake didn’t look that great. So, after another couple of random sketches, I found that I was making a painting set in a cosy, but ominously gothic, version of 1980s/90s America. Well, today, I thought that I’d talk briefly about how useful it can be to be open to artistic influence. Before I go any further, I should probably link to my article about how to take inspiration properly (again!) since it’s an important thing to bear in mind when allowing yourself to be influenced. Anyway, I thought that I’d write about this subject again because I noticed that I’d been inadvertently influenced by an old computer game I’d been playing recently called “Riven” (that revolves around exploring a series of mysterious islands and solving puzzles). This is a reduced-size preview, the full size painting will be posted here on the 29th January. If you’re new or inexperienced at making art, then the idea of being influenced so often might seem strange or scary. After all, you probably want to make your “own” type of art that is an expression of your own imagination, rather than something that is inspired by whatever you happened to be watching or playing recently. Well, as counter-intuitive as it sounds, being influenced regularly can actually help you to express your own imagination. Why? Because you have to find a way to turn those pre-existing inspirations into something new and original. In other words, you have to use your imagination to come up with a way of incorporating your influences into your own art, without directly copying them. Plus, of course, you’re the one who chooses what you are influenced by. Generally, you’ll probably be more likely to take influence from things that you consider to be “interesting” or “cool”. So, you are still in control of your own artistic development. Likewise, taking influence regularly also means that you are expanding your imagination too. It means that you’re learning new things, imagining new things and coming up with your own “version” of new things on a regular basis. Plus, being open to artistic influence is also how you develop your own art style too. For example, as I’ve mentioned before, one of the latest changes to my style happened when I played this set of fan-made “Doom II” levels and was so impressed by the colour scheme used in it that I ended up changing how I used colours in my art (eg: I started focusing on including 2-3 complementary colour pairs in my paintings, I started using a slightly smaller colour palette etc..). But, my art style has also been influenced by things like western cartoons/comics from the 1990s, anime & manga, heavy metal & punk album covers, old horror novel covers, etc…. It’s a unique mixture of different things. So, if you want a unique art style, then take inspiration from lots of different things. But, best of all, being open to artistic influences also means that you’ll feel uninspired less often, which is great if you have a regular practice schedule. What it means is that, if you’re feeling uninspired, then you can sometimes get over it by either watching or playing something interesting. Yes, you still have to find a way to translate that inspiration into a piece of new and original art, but this is something that becomes easier with practice. Woo hoo! Inspiration! This digitally-edited painting was kind of an interesting one. Originally, I’d planned to make a gloomy and slightly minimalist painting based on some wonderfully atmospheric rainy weather I’d seen a few hours earlier. But, as I started sketching, I thought of the street scenes in “Blade Runner” and decided to start painting a dense cyberpunk city. But, then it kind of turned into a strange vaguely post-apocalyptic cyberpunk seaside town instead.